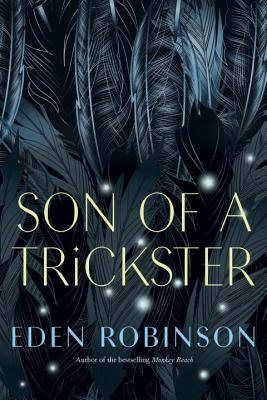 Eden Robinson is a fantastic writer. And I was anticipating this book, her first novel in a decade. Imagine my excitement when I heard in was to be the first of a trilogy! Then I read it. Surprise -- it was even better than I'd expected, no let down here! Robinson takes us into the life of teenager Jared, who gets by living a very adult life even while still attending high school. He bakes weed cookies for a little income now and then, that is, alongside his paper route and yard/house work for the old couple down the street. Jared is a sweet boy despite everything. And everything includes a mother who is usually pretty wild, either partying, on drugs, or with weapon in hand. She is not one-note, though, and neither is her live in boyfriend, a drug dealer who is also a bit more complex than you'd expect. Jared has also had to deal with a grandmother who has never liked him, calling him the son of a trickster, or Wee'git. He doesn't know why, or what she means. But in this sixteenth year, he starts to see things, like a cloud of philosopher fireflies encircling his girlfriend, and to be approached by talking crows and otters. Add the regular 'normal' life problems of unflattering videos of him posted on youtube by the popular kids, or getting in fights when drunk, or getting rolled for cash by unknown assailants while just trying to beat some butter for cookies, and Jared is having a tough time. But when he is kidnapped by cannibalistic river otters he knows something isn't quite right. Enter Trickster. This is an imaginative, energetic narrative that has a wild plot, veering from banal everyday struggle to magical intervention from the indigenous spirit world into Jared's life. The characters are very strong -- Jared himself is so complicated and interesting as a protagonist, and his deep (though complicated) relationship to his mother is vital to the book. She's not a villain, despite her extreme foul mouth and bad habits; in fact she was very interesting, with reasons for the things she does. I thought his high school life was believable, the responsibility he feels to his estranged father touching, and his strong connection to the old couple down the street was powerful. By the end of this book we are just starting to discover Jared's true paternity and ancestry. And to see some resolution in a few relationships, while it's more dissolution of others. I can hardly wait until the next volume to find out more about Jared and his family's connection to his Trickster father. This was a great read, and a great start to a longer story. And then you can listen to the Unreserved Indigenous Reads Panel discuss this novel. Am so very glad to hear that this measured up to your expectations. I've read everything of hers and was a bit put off by the gap between works here, concerned that it might not be as good as her earlier stuff, but you loved it! Melwyk, this sounds like a fascinating story with incredibly drawn characters. You have once again whetted my interested in a book, or a trilogy in this case. I'll keep this one in mind, definitely! It is great - though I probably should have mentioned somewhere that there is a LOT of cussing in it, if that bothers a reader -- I think it works well and was actually quite entertaining in this book.